From humble beginnings to serving 1000s of loyal customers a week. We pride ourselves in our service with a smile! 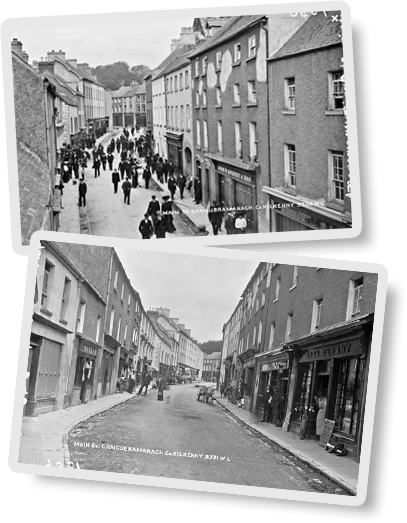 First established in 1904 as a bar and grocery at Main St., Graiguenamanagh by Thomas Joyce, over the years the business has grown, transformed and manifested itself many times, in many ways and in many premises in Graiguenamanagh and New Ross. As you’ll see from our website or a visit to our 2600M² store, we now offer neither food nor alcohol but just about everything to do with its preparation, cooking and serving plus a lot more besides. In essence, our business is all about your home. At Joyces Home Centre our aim is to be honest, open and fair in all our dealings with you, our staff and our suppliers. We want to understand your needs; provide you with quality products; value for your hard earned money and do so with attentive, knowledgeable staff whose aim is to make each visit you make to us satisfactory in every way. We’re here for you. You are our work. Without you we have no work!